Divine – or should that be de-vine! 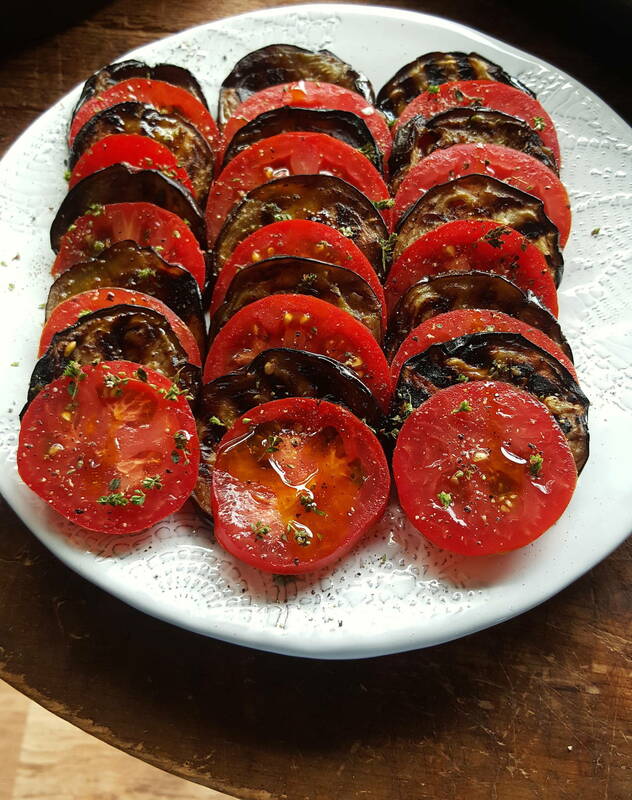 Yes, just-picked tomatoes (off the vine), layered and stacked with eggplant. You can't fail with this Greekish combination. No biggie here, just a combo that is always going to work: char-grilled eggplant and big meaty Thessanoliki tomatoes. All you need is good bread, good wine and a friend or two to enjoy the feast. Read all about eggplants before you start. I’m so pleased to read your instructions on cooking eggplant. In the past I’ve been disappointed that it is soggy and not that nice after cooking and now I know why. Using crumpled paper was interesting. Should you use scrunched up paper towels or would scrunched up baking paper be preferable? That’s great Sara. Scrunched up baking paper is preferable, or you can put the eggplant on a rack over paper towels (the paper towels will catch the drips). Deep dark mysterious tomatoes from the Crimea meet sticky black garlic from New Zealand. Wham! Love at first bite!